4. the low value provided to SHDN is 0V. Is it possible to have a scope shot showing your results? Can you place the scope probes on the nodes VBatt, SHDN, and +VH? IT would be better if you could show the result when you toggle the SHDN node to logic 0. Another question would be, what is your power-up sequence? Does SHDN goes before Vbatt is being provided in the system? Also, it seems that you are trying to power-up the ADG1408 and ADG1404 at 3.3V. 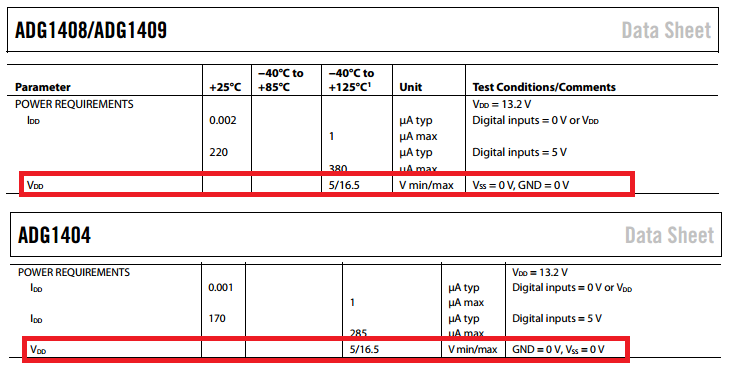 Please have a look at the Power Requirement Table of the Specifications Section of the respective datasheets, it is stated that the ADG1404/08 are operational from 5V to 16.5V in single supply rail. See figures below. So if +VH = 3.3V only, it will not power-up the ADG1404 and ADG1408s. You might want to have a look at these points too.